The Dell Latitude 10 Essentials comes with a 10.1 inch display, Windows 8 and an Intel Atom chip. Dell wants the essentials reach ordinary consumers and therefore brings the reduced version of the Latitude 10 on the market. The Dell Latitude 10 Essentials is a new 10-inch tablet with Windows 8 from Dell should be fetched with the ordinary customers on board. In the previous Dell Latitude 10 would be more likely to achieve business customers, but at the Latitude 10 Essentials some features removed, and thus brought the price down to 499 U.S. dollars. For the former Latitude 10 had to put at least 700 euros on the table. 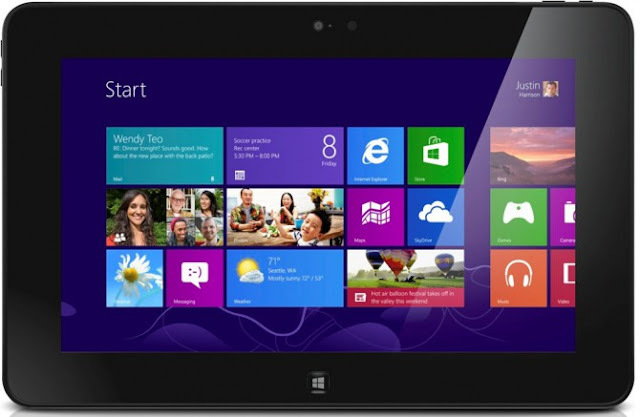 The Dell Latitude 10 Essentials is an Intel Atom Z2760 Dual Core processor, which is clocked at 1.8 GHz. The 10.1-inch display has a resolution of 1366 × 768 pixels and has the essentials no active digitizer. Unlike the business tablet on the display so you can only use a stylus for capacitive screens. Also deleted was a microUSB port, and a microHDMI output. At least still has the SD card slot available and there is a USB 2.0 port. Back there is an 8 megapixel camera. Unfortunately, it is at the Dell Latitude 10 Essentials give no 3G or 4G option, what else was often offered as an option on Dell products. Even the battery is in the Essentials model permanently installed and can not be replaced. For this, the Dell Latitude 10 Essentials with 32GB memory will cost only 499 U.S. dollars, while you have to pay for 64GB memory 579 U.S. dollars. The Dell Latitude 10 Essentials should be handled better than tablets like the Acer Iconia Tab W510 . In the latter, you get the same price but still a keyboard dock comes with an extra battery.